The present study investigated the feasibility of a single-stage operation consisting of self-expandable metallic stent (SEMS) placement followed by laparoscopic surgery for obstructive left colorectal cancer. From July 2002 to March 2007, 17 consecutive patients with primary obstructive left colorectal cancer underwent SEMS placement followed by laparoscopic surgery. Data were collected retrospectively regarding clinicopathological findings, SEMS placement, operative procedures, and perioperative outcomes. Technical success was defined as successful stent deployment across the obstructive lesion, and clinical success as the possibility of performing a single-stage operation without creating a stoma. In the laparoscopic group, the technical success rate was 100% (17/17) and there was no morbidity associated with SEMS placement. 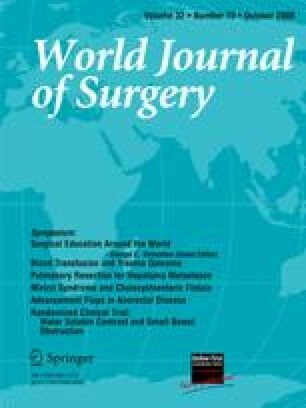 The median interval to laparoscopic surgery was 7 (range, 2–11) days, and the procedures included 11 anterior resections, 3 left hemicolectomies, 2 Hartmann’s procedures, and 1 subtotal colectomy. All procedures were completed laparoscopically without conversion to open surgery. The median operating time was 178 (range, 93–377) minutes, and the median estimated blood loss was 100 (range, 50–400) ml with no cases requiring intraoperative transfusions. The clinical success rate was 82.4% (14/17), and there was no surgical morbidity other than two patients in whom chyloperitoneum and ileus were controlled by using conservative management. The median postoperative hospital stay was 9 (range, 7–49) days. A single-stage operation consisting of SEMS placement followed by laparoscopic surgery seems to be a feasible and safe treatment option for obstructive left colorectal cancer.